It overlooks Piazza Castello in the heart of Sassari, where once stood an opening in the walls of the medieval citadel, revealing in its architecture and furnishings a complete and splendid expression of Baroque art. 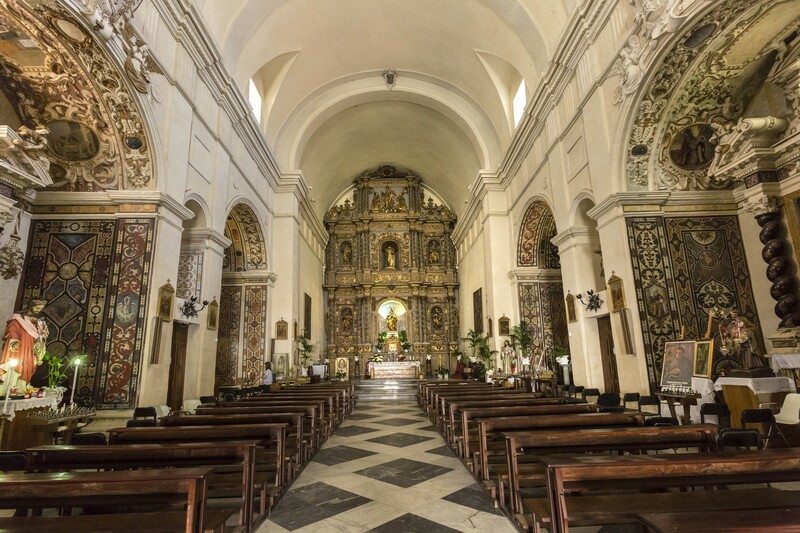 It is thanks to the hard work of the Dominican monks that the first church of Madonna del Rosario was built, together with the convent, in 1635. The temple was rebuilt and enlarged twenty years later, taking on its present form. All was completed in 1759 with the façade, the work of Gavino Pirinu from Sassari, arranged into two sections. At the centre of the lower part stands a portal framed by Corinthian columns and an entablature, from the ends of which rise two volutes that simulate a curvilinear pediment. Inside, a niche houses the statue of Our Lady of the Rosary. The second segment is narrower and smoother, with a central high-arched window. Immediately upon entering, the gaze is captured by the high altar. 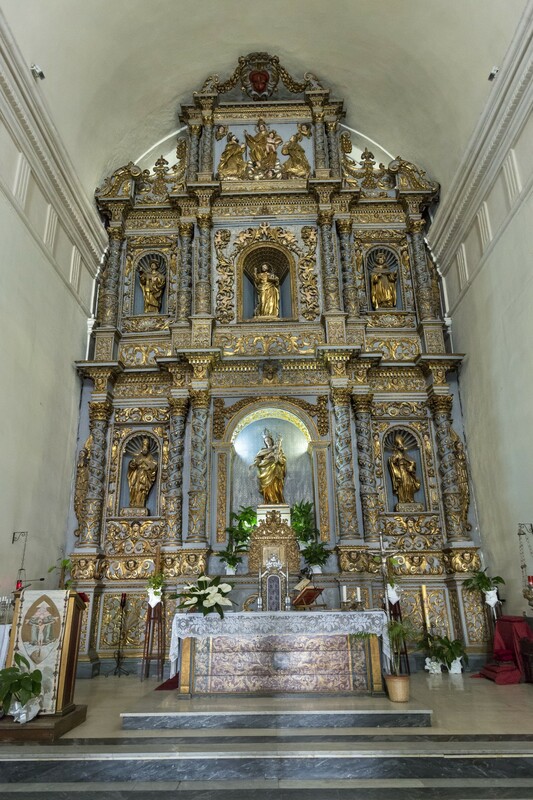 The entire back wall is occupied by the monumental Altarpiece of the Rosary (1682) carved in wood, polychrome and gilded, considered in terms of its size and value as one of the most important works of sacred art on the island. It is structured in three sections, the lower two including six statues inside niches and the upper fastigium. As is customary in Sassari religious buildings from the 17th and 18th centuries, the church has a single nave divided into three bays, on which are three chapels on each side, with a barrel vault. In the background, dominated by the wooden retable, are the raised presbytery, which connects to the hall through a triumphal arch, and the apse, both with a quadrangular layout. The presbytery is covered by a barrel vault that stands on a moulded frame, decorated with adornments and a triglyph frieze, marked by double transverse arches. The side chapels are entirely decorated with motifs imitating marble inlay, a baroque decorative technique that is unusual in the Sardinian context. Inside, stone and stucco altars stand out, painted with marble effects and characterised by a great variety of ornamental motifs. 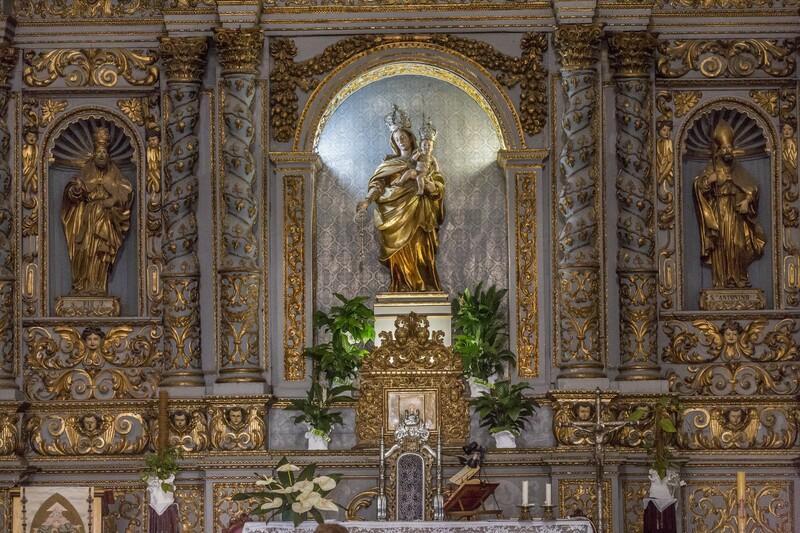 The structures and ornamentation of the Madonna del Rosario can be traced back to a project that included workers from Liguria and Lombardy undertaking a project in Sassari at the end of the 17th century. Baroque architecture and decorative solutions can also be found in the rich façade of the Duomo di San Nicola (cathedral), in various works and the decor of the church of Sant'Antonio Abate and in the furnishings of San Pietro di Silki.